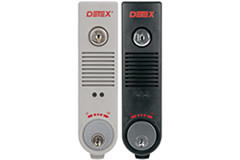 Door prop alarms are used to signal when a door has been opened longer than a specified length of time. These alarms are often used in businesses and schools to ensure security in making sure doors are never left open. The duration of time the door has to be open before an alarm will sound varies and can be set during installation. Typical times are in the 30 second to 1 minute range. Door prop alarms can be stand alone units (as seen in the picture below) or in newer access control systems they are built into the access panel and monitored from a central security location. If you have a need for a door prop alarm in metro Atlanta contact us and we would be happy to design a system for your particular needs. As your trusted Atlanta Locksmith we can service and install all your door prop alarms.